My dream is to write picture books for children; I’ve been learning all I can in the past few years about writing for children. I’ve taken many courses online (mainly through writers.com) and have loved and learned from each and every class. I’ve been working with a wonderful, established American children’s author, who is assisting me with invaluable feedback on my work. When my first children’s book is published, I will owe her a tremendous debt of gratitude. 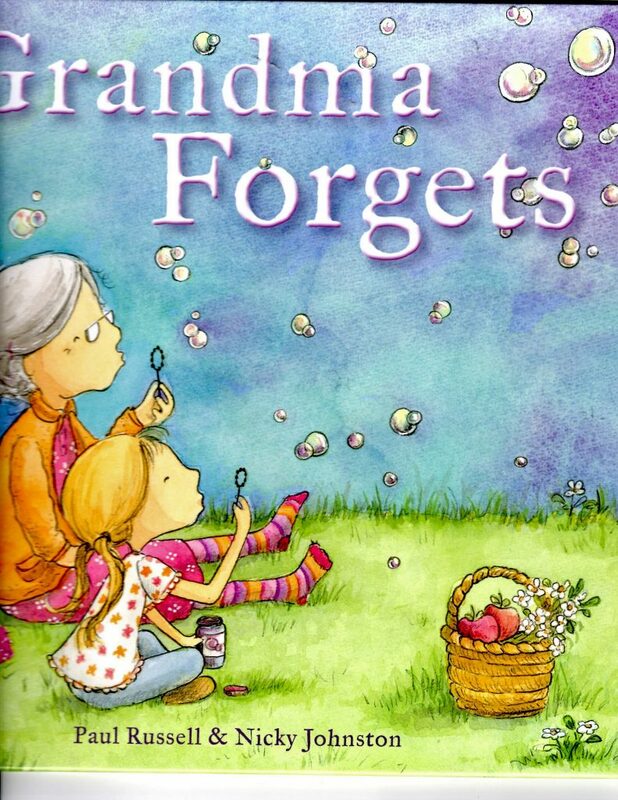 Grandma Forgets by Paul Russell & Nicky Johnston is just the type of book I aspire to write. It touched my heart and I wanted to share it with you all. Grandma has Alzheimer’s and doesn’t always remember her children or her grandchildren. Undaunted, Grandma’s family perseveres, visiting with her often, reminiscing about her wonderful long life and all the activities they have done together. The illustrations of their memories moves the story along. The most lovely part of the book is that Grandma is always cheerful, always willing to engage with her grandkids, even if she doesn’t remember who they are. To the young granddaughter in the story, the most important thing is that Grandma knows how much she is loved. Maybe a family member could make Grandma a “quilt of memories”? Maybe that would help her to remember? Maybe that’s another story. Loved looking through your site and was very glad to hear that you enjoyed my book. Best of luck with your own writing. Links to some of our favorite places!